You should mention that this smooth transmission required that the computers be hard wired to the Internet. Using a computer with a wireless link introduces irregular delays and a jerky needle movement that will obscure reads. Using a computer with a wireless connection causes the audio and the video to be out of synch on regular Skype video connections. 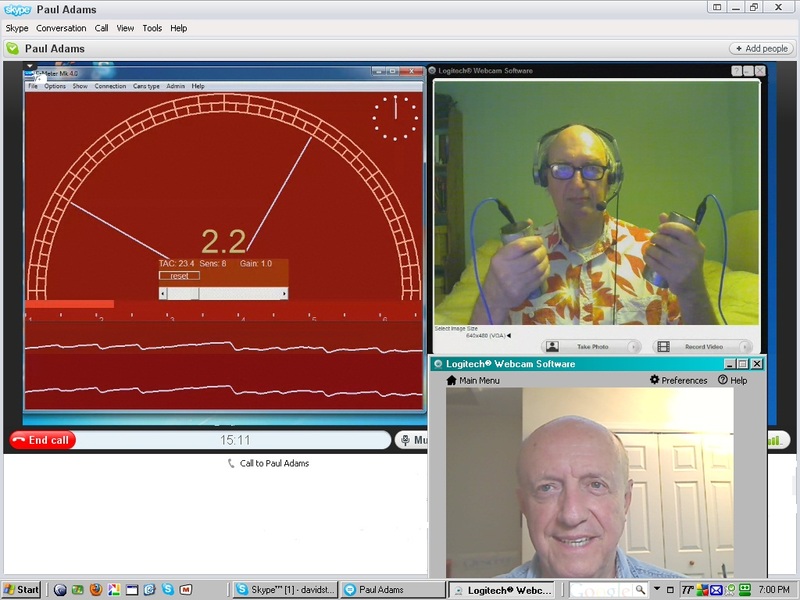 If anyone would like to run a test with me, give me a call on my Skype connection and I will be able to give you a live demo of what a meter looks like over the Internet. Well, I want to validate — and APPLAUD!!! — David St. Lawrence for his expert guidance in auditing me, ‘over the internet’ through Clear and well into my OT levels with the kind of efficiency, effectiveness and results which we all came to know and adore about Scientology when Scientology was Scientology and not something else. There is no question but that internet auditing is doable, possible, workable, useful and delivers superlative, standard and mind-blowing wins. I have been the, constant, recipient of such wins, such remarkable progress, such standard LRH auditing from David St. Lawrence. He’s a Master at what he does. I urge you who want to get better to find an auditor like David and (politely) demand standard auditing. It’s there for the having, and it doesn’t require long and expensive airplane trips to big buildings. All you need is the intention and a computer of your own, and there are many expert independent scientology auditors who will blow your socks off as David St. Lawrence has blown my off!!! Finally, if I may make a suggestion. Don’t ‘cheap out’ on the PC you use. Laptop or Desktop doesn’t matter. But, consider how much the CofS charges for one of their meters — what, now, even a cheap one is about $5,000.00? For less than 1/2 of that you can buy a state of the art quad core, mega, mega, mega hertz, 1 terabyte, web cam installed, blah, blah, blah, blah PC, PLUS the meter.